There are similarities between value investing and enterprise risk management (ERM) methods. For some, especially portfolio managers, this may be obvious. These investors come to the table with experience using risk as a constraint while trying to optimize returns. Years of experience have taught this group that risk balances return, and that return balances risk. Value is added by creating favorable imbalances. The investor with high returns and average risk has succeeded, as has the investor reporting average returns and low risk. Many concepts are shared between ERM and value investing. When defining risk, which is generally unique to the individual, an analyst considers uncertainty, downside risk, and optimization. Value investors look at concepts like conservative assumptions, margin of safety, and asset allocation. These concepts are comparable, and this paper uses the International Actuarial Association’s Note on enterprise risk management (ERM) for capital and solvency purposes in the insurance industry to take the reader through general ERM topics. This is followed by a comparable value investing discussion and a comparison of the two practice areas. In some firms, a risk manager is placed in a position with little authority, limiting the benefits of ERM. A process driven ERM function can identify risks and risk owners, create a common language, and send useful reports to the Board. A stronger risk officer adds value by using transparency to understand risk interactions, scanning for emerging risks and generally keeping a focus on how an entity’s risk profile is evolving. 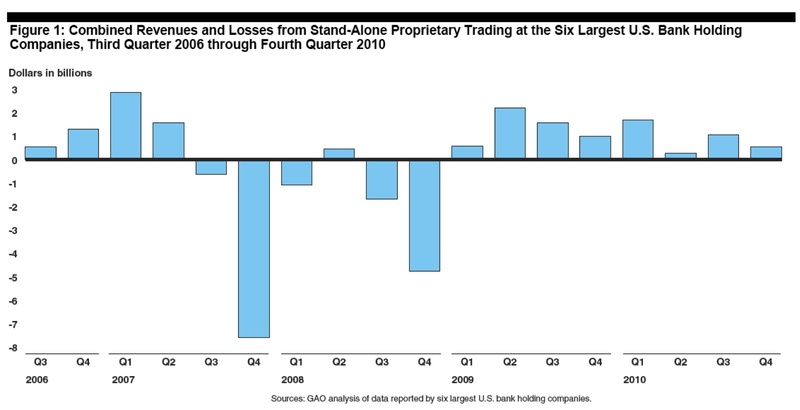 The GAO last week released a report on Proprietary Trading of banks. The headlines feature a conclusion from the report that the six largest US banks did not make any money our of Prop Trading over the 4.5 years of the study period. The analysis looks pretty straightforward. But it is difficult to see if the conclusions are quite so obvious. First and most important for a risk manager to notice is that this is a post facto analysis of a risky decision. Risk Managers should all know that such analysis is really tricky. Results should be compared to expectations. And expectations need to be robust enough to allow proper post facto analysis. That means that expectations need to be of a probability distribution of possible results from the decision. Most investments had performance that was vaguely similar to the pattern shown above during that time. Is the conclusion really anything more than a 20-20 hindsight that they should have stayed in cash? That is true everytime that there is a downturn. Above is a graph of a steady long position in the S&P. On the other hand, traders in such situations seem to generally get paid a significant portion of the upside and share in very little, if any of the downside. In this case, the downside cancelled out all of the upside. The good years had gains of over $15.6 B. If the traders were getting the usual hedge fund 20% of the gains, then they were paid 3.9 B for their good work. In the bad years, banks lost $15.8 B. That means that the gains before bonus were $3.7B. Incentives were over 100% of profits. The one other question is why investors need banks aas intermediaries to do prop trading? Why can’t investors do their own prop trading? Why can’t investors go directly to the hedge funds or mutual funds or private equity funds? Ultimately, the report says that prop trading was not really significant to bank earnings and not a real diversifier of bank volatility. So in the end, is there any reason for banks to be doing prop trading? It seems that the banks are reaching that conclusion and exiting the activity. Are We “Due” for an Interest Rate Risk Episode? 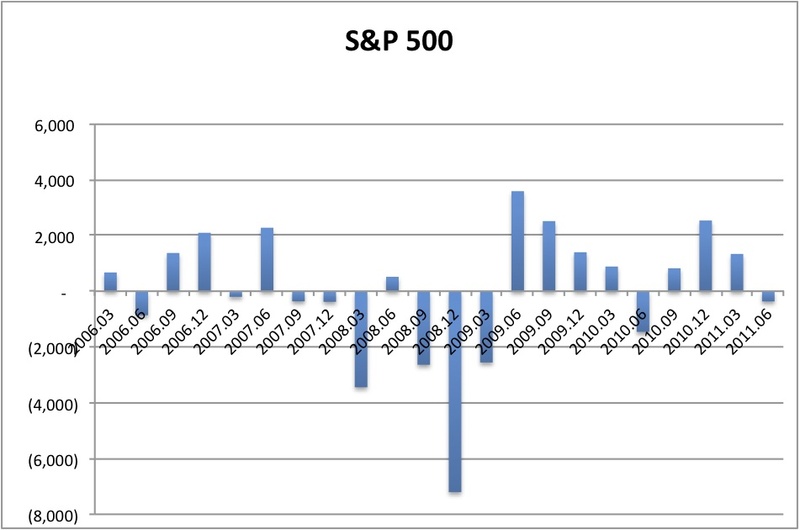 In the last ten years, we have had major problems from Credit, Natural Catastrophes and Equities all at least twice. Looking around at the risk exposures of insurers, it seems that we are due for a fall on Interest Rate Risk. And things are very well positioned to make that a big time problem. Interest rates have been generally very low for much of the past decade (in fact, most observers think that low interest rates have caused many of the other problems – perhaps not the nat cats). This has challenged the minimum guaranteed rates of many insurance contracts. Interest rate risk management has focused primarily around lobbying regulators to allow lower minimum guarantees. Active ALM is practiced by many insurers, but by no means all. Rates cannot get much lower. The full impact of the historically low current risk free rates (are we still really using that term – can anyone really say that anything is risk free any longer?) has been shielded form some insurers by the historically high credit spreads. As the economy recovers and credit spreads contract, the rates could go slightly lower for corporate credit. But keeping rates from exploding as the economy comes back to health will be very difficult. The sky high unemployment makes it difficult to predict that the monetary authorities will act to avoid overheating and the sharp rise of interest rates. Calibration of ALM systems will be challenged if there is an interest rate spike. Many Economic Capital models are calibrated to show a 2% rise in interest rates as a 1/200 event. It seems highly likely that rates could rise 2% or 3% or 4% or more. How well prepared will those firms be who have been doing diciplined ALM with a model that tops out at a 2% rise? Or will the ALM actuaries be the next ones talking of a 25 standard deviation event? Is there any way that we can justify calling the next interest rate spike a Black Swan? There is no generic risk. There are many risks. Are you getting fair compensation for the risks that you are taking? If not, invest in other risks, or if there are few risks worth taking, invest in cash, TIPS, or foreign fixed income. To this end, it is better to think in terms of risk factors rather than some generic formulation of risk. Ask yourself, am I getting paid to bear this risk? Look to the risks that offer the best compensation, and avoid those that offer little or negative compensation. Modern Portfolio Theory has done everyone a gross disservice. It is not as if we can predict the future, but the use of historical values for average returns, standard deviations, and correlations lead us astray. These figures are not stable in the intermediate term. The past is not prologue, and unlike what Sallie Krawcheck said in Barron’s, asset allocation is not a free lunch. With so many people following strategic asset allocation, assets have separated into two groups, safe and risky.